The seminar will be held Chief Instructor of IWCO-Israel Eugene Paramonov. IWCO seminar on level 4 (Cham Kiu, Hok Yuen Sae Kup) was held in Moscow June 15-16, 2013. IWCO students from cities: Moscow, St. Petersburg, Voronezh, Krasnodar, Kaluga, Peryaslavl-Zaleski, Bugul'ma, Zelenograd participated in the seminar. IWCO seminar on the technique of "Mui Fa Jong" (5 columns) was held in Moscow on June 1-2, 2013. IWCO members with certification level 5 Kup (Hok Yuen Ng Kup) and above participated in the seminar. 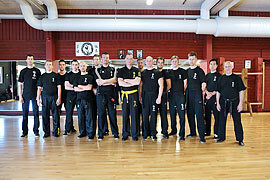 Regular examinations of the International Wing Chun Organizatiom held in Haifa, Israel. Congratulations to the IWCO-Israel students with successfully passed exams! 1. Why Chi Sao is the bridge between the empty hand forms and real life fighting?